Karl Urban was a great find to play the recast "Subprime" Bones, among a brilliant casting job of capturing the essence of all the original crew. But for a lot of us there's only one face and one name that will always be the Real McCoy. 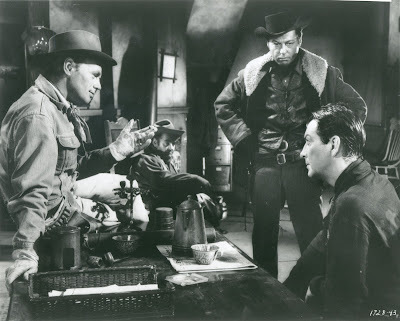 Or Western badasses like "Wexler" from John Sturges' The Law and Jake Wade, in 1958, here with Richard Widmark and Robert Taylor. Happy birthday, DeForest Kelley. Hardly looks 90, does he? He passed away over ten years ago and it's still hard to believe he's not with us anymore. That's about as great a tribute one can make, Mike. It also sounds a lot like the last lines of "Wrath of Khan"...! And is exactly the way I feel. As long as I have Trekland we will always celebrate's De's birthday. Thanks for the reminder... the memories... and the dedication to keeping De's memories burning bright in the TREK (and westerns) constellations. 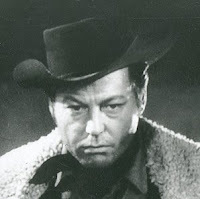 author of DeForest Kelley: A Harvest of Memories and The Enduring Legacy of DeForest Kelley: Actor, Healer, Friend.